Gordon Rahere Hoare: the Arsenal player who transferred 23 times. According to Wikipedia Gordon Rahere Hoare (18 April 1884 – 27 October 1973) was “an English amateur footballer” – and that’s all you get. Which is rather sad given the extraordinary nature of his engagement with the game. Now if you are a regular reader of this site you might recall that we already have an article on Gordon Hoare, but I am adding this one to add some more detail that I have discovered from a most remarkable site: Football and the First World War. If you’ve been following any of this story you’ll know that one of the key problems for Woolwich Arsenal and for Henry Norris in his initial engagement with the club was in finding proven goal scorers, and inside forwards who could supply them. We’d even converted our centre half into a centre forward, and still nothing worked. Players came in and went out, getting one or two games before moving away. Anyway, Gordon Hoare joined Woolwich Arsenal in 1907 and played for the first time against Sheffield Wednesday at the end of the 1907/8 season. He stayed on the club’s books as an amateur and played 11 first team games in the 08/09 season. But despite the total failure of Arsenal to find a suitable forwards he was not picked throughout the opening part of the 1909/10 season, until this last match in November. He got his game, but it was too little too late, and he moved to Glossop North End in December 1909. Now this is rather interesting because Glossop, despite being a little market town in Derbyshire at the time had a second division team which had got to the quarter finals of the FA Cup in 1908–09 where they lost to 1-0 to Bristol City after a replay. But this is the real twist: the chairman and (inevitably) benefactor in 1909 was Sir Samuel Hill-Wood, who later became chairman of Arsenal and whose descendants ruled the club until the events that led to the takeover by Stan Kroenke. They were significant in the eventual overthrow of Henry Norris at Arsenal. I don’t have access to playing records for Glossop but somehow and for some reason one year later, almost to the day, Hoare was back in Woolwich Arsenal. This time he got 14 games and six goals before going back to Glossop in 1912. In all he had 13 clubs – although this is a bit misleading because two of those were Woolwich Arsenal, and one was Arsenal! But I suspect that will have meant less than the fact that he played all three matches for England (ie Great Britain) in the 1912 Olympics and so won an Olympic Gold. He scored two goals in the final against Denmark. He retired from football in 1920, and died in 1973 at the age of 89. If any descendant of Gordon Hoare should ever read this and would like to contribute more to the story, I would be honoured to include additional information from such a prime source. If I have got anything wrong thus far, please accept my apologies – I am more than ready to correct the data. The link with Fulham of course is tantalising – as Sir Henry Norris, as he was by then, was director of both Fulham and Arsenal until the bust up over the London Victory Cup. I can’t tell if Hoare went back to Fulham before or after that acrimonious dispute, but if after, it seems curious that Sir Henry would allow any player to go to Fulham at that point, so bad had relations become between the two clubs. And now I want to quote wholesale from the Football and the First World War site, because they have produced a complete analysis of Hoare’s progress as a player. I think this is incredibly valuable because it shows the wandering nature of some amateur players at the time. Hoare was by no means the only player we have come across to move from club to club so readily but each time we find one, I find it a fascinating reflection on the way football was played at the time. That really is a record and a half. Section 2 – 1911 and the players used thus far. Henry Norris at the Arsenal part 9: 1911 – Arsenal escape relegation. The above article contains links to all the players of the era whose lives we have already covered in articles on this site. Jackie Chalmers: the man who rescued Arsenal, but then rode back to the north. 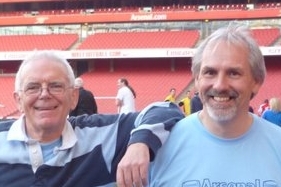 4 comments to Gordon Rahere Hoare: the Arsenal player who transferred 23 times. Janey we must be distantly related somehow. Gordon is my great, great uncle apparently but that is all I know. My grandfather was Eric Hoare.